I just found this nifty curse base file manager that is available in OpenBSD port/package - Ytree. Ytree is very lightweight file manager, however it has all the features that supposed available in the file manager, I don't think it suits everyone's need because most people prefer a gui file manager, but you should check out this one. Ytree allows you to browsing the directory tree, copy, remove or rename files whenever you want, it also shows the file size and disk space info on the right pane, one of the reason I like it is that I can just run it when I ssh remotely to the terminal or the servers without X, many will say they can just use ls but once you get yourself handy with ytree especially when you comfortable with it's key command, you can navigate all the files easily with Ytree. The other thing is that you can even execute the command directly while you are still browsing your file manager and get back to your file manager once you have finished the execution, the argument of the command can be changed on the fly as well. The only con I found would be the problem where I can't navigate to the the previous parent directory, what I mean is that if I start running Ytree at /usr, I only can browse through all the file unders /usr and can't go to / or /home and etc, so I have to start running Ytree at / which is the root of the system that allows me to navigate all the files. If you are learning FreeBSD system, or you feel like learning it, here's another good learning resource for people out there - The Complete FreeBSD that written by Greg Lehey. The book is about 700 pages and containing lots of tips, even it's a little outdated and that's where Greg encourages people to contrib by publishing it on internet freely, however it's still worth to spend sometimes reading it. The book is under Creative Common License now, feel free to download and reading it. It happens when you have logged full network content data with tcpdump, where you have very big size pcap file such as 2GB or maybe 10GB, and you try to load it to the ethereal so that you can analyze but ends up your ethereal hangs, I think most people won't have enough RAM for that kind of situation, there we need to slice the pcap file to pieces so that we can work with ethereal or other analyzing tools, there's third party tool like tcpslice. However here I just want to use tcpdump and here's how I do it. 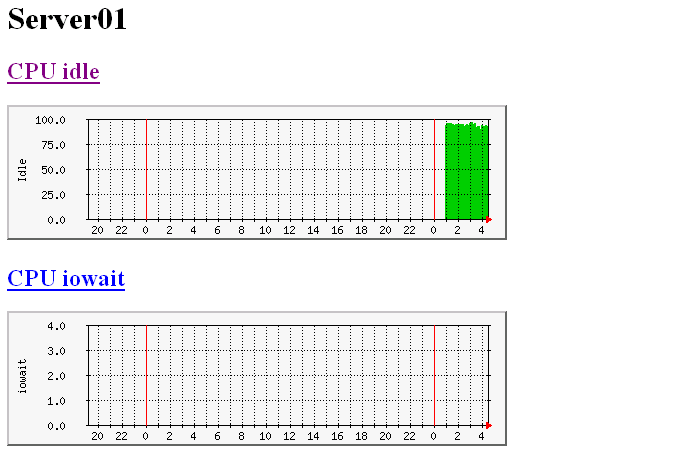 I log the traffic at first, after that I just terminate it after a while and it's size is around 2GB. # Create the directory to store the trace file. echo "Which directory you want to store the trace file?" # Create file with the sequence of number behind it. Which directory you want to store the trace file? Run tcpdump with -C 200 which will cut pcap file size down to 200MB and then write to the blank trace file, it starts counting at 2, that's why we specify the first file tcpdump writes to is trace_1, then once it reaches 200MB, it will write to trace_2 and follow in sequence. Once finished, you will see all the files in 200MB size except the last part which is less than 200MB, we will have trace_1 till trace_10. By now you should be able to load the smaller size of pcap file to your ethereal, remember to tweak the shell script to fit your need especially how many trace files expected to be created based on the total pcap file size. p/s: In my blog, command executaion in shell always in bold and config file or shell script content always in italic. Just noticed in the PF mailing list that mentioning about dfd-keeper - the dynamic firewall daemon for PF that ease the administrations of OpenBSD PF, wondefully it is written in python languagage. I won't talk about what you can or can't do with dfd-keeper since it's already mentionned here, I will rather showing quick installation of dfd-keeper which is not clear in it's INSTALL doc. 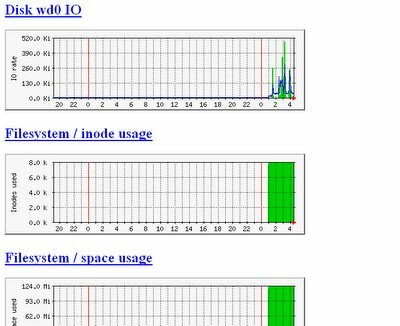 Assuming you are running OpenBSD Current just like me. Currently dfd_keeper is not supporting remote login since it only binds to localhost, it will only allow remote login once Travis(dfd_keeper coder) get ACL done in the future. By now you should be able to play with dfd-keeper. Finally I finished downloading OliveBSD, the download link that provided is extremely slow, bet there are many people out there downloading it simultaneously. I quickly burn the iso and load it to my machine, it loads properly without issue and automagically I can connect to internet without any configurations since it uses dhclient to get the dynamic IP and I have dhcp server in the LAN, however you can setup network configuration properly by clicking the Network Card Configuration in the application menu, Gabriel has done this part nicely by writing his own net config script that ease user's experience. The window menu is well done with all the applications that needed to run daily tasks such as firefox, thunderbird, xchat and etc. Previously I have reader saying that firefox slow to load but it seems not happening to me where firefox loads within seconds in my testing. Other applications also loads properly without problem for me. Overall OliveBSD is totally perfect for new users who want to know what is offered by OpenBSD, and I find nothing much differences either using OliveBSD and other Linux distro that targets desktop users, the only thing is that you won't find OpenOffice in OliveBSD since it's not in the OpenBSD port. The file manager that used by OliveBSD is Rox-Filer, there you can easily change background and browsing files. Overall I give a thumbs up to this liveCD, not because it's based on OpenBSD but it really does what it does. Thumbs up goes to Gabriel, you have done a good job. I have just successfully installed prelude-IDS, I'm happy as I can get it installed on OpenBSD without much hassles, however it turns me down when I tried to register the sensor to the prelude central management server. 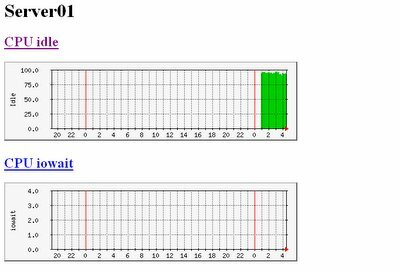 It seems that it has a bug where when I try to register the sensor, the server end is listenning at ipv6 space, so registration failed all the time. I quickly login to irc.freenode.net #prelude channel to look for help. 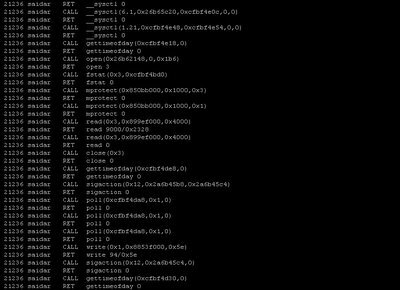 The lead developer of prelude-IDS, Yoann, is a very nice and helpful person, I quickly run gdb to locate the bugs to report and he fixed out and sending patch to me, he has also asked me to submit the bug report using strace if it;s not fixed after applying the patch. The patch fixes the bugs perfectl. 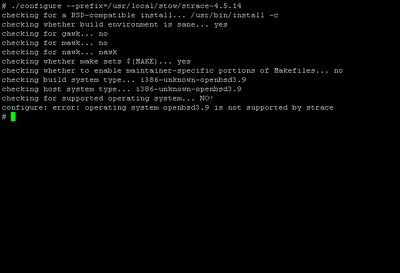 However since I feel adventurious, I'm thinking of installing strace on my OpenBSD box, however when I try to install it, I get an error where OpenBSD is not a supported OS. 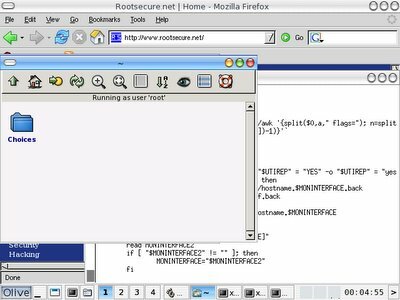 Then Yoann told me to use ktrace which is similar to strace but it is native tool of OpenBSD, however to use ktrace properly, you have to use kdump to read ktrace's output. From the man page, ktrace enables kernel trace logging for the specified processes, and it is used to trace system calls, IO, and etc for process. 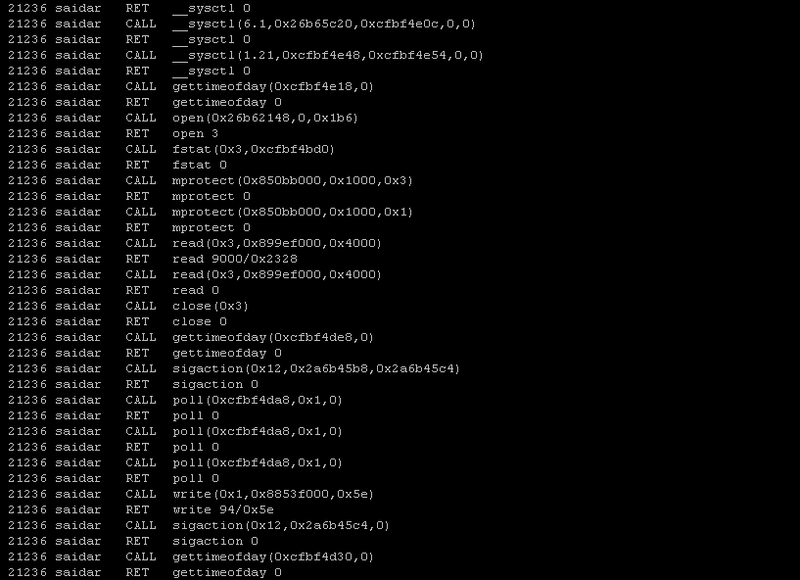 In order to perform ktrace, I just take libstatgrab monitoring tool - saidar as an example. Below is the output of kdumping saidar, it looks similar to the strace output. VI editor, while it's trivial to new users, it is always get me excited. I had just learned that there are two ways to get to the last part or end of the file easily with vi, one is using vi mode, you just need to press G key, another one would be using the command mode which is preceded with :, you can just type $ to go to the last line of the file. It is always fun to discover new tricks of using vi even though I have been using it for so long, in order to be proficient enough in using vi, I force myself to use the build in commands more often however there are still many uncovered or unknown tricks that I should try to figure out and learn, that's the interesting part of vi, you will never have enough. Then it will show the error if there's any or else just success without error. I found a virtual memory monitoring tool in the port, with it I have more clear view of how actually system memory works. 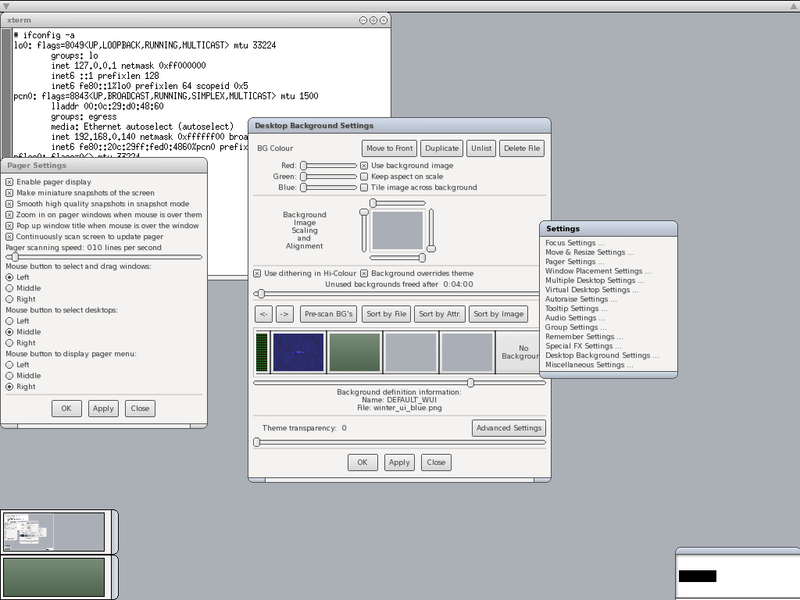 The UVM virtual memory system manages access to the computer's memory resources. User processes and the kernel access these resources through UVM's external interface. By the way there's great documenetation out there that really helps me a lot in order to understand it, you should check it out here even though it is more on NetBSD system. 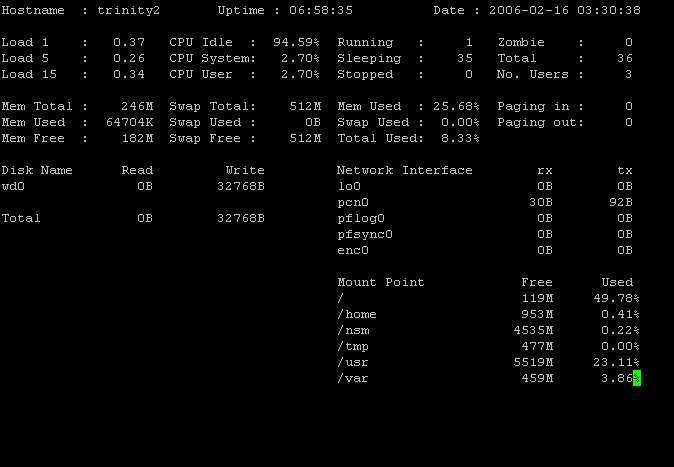 You can also find the man page useful especially uvm and vmstat in this case. I'm currently reading this book that written by Ellie Quigley to sharpen my shell scripting skills, I haven finished half of the book. These days I'm more to reading book than online materials especially on my off days since it's what I need to get in depth on something and more self-contained. 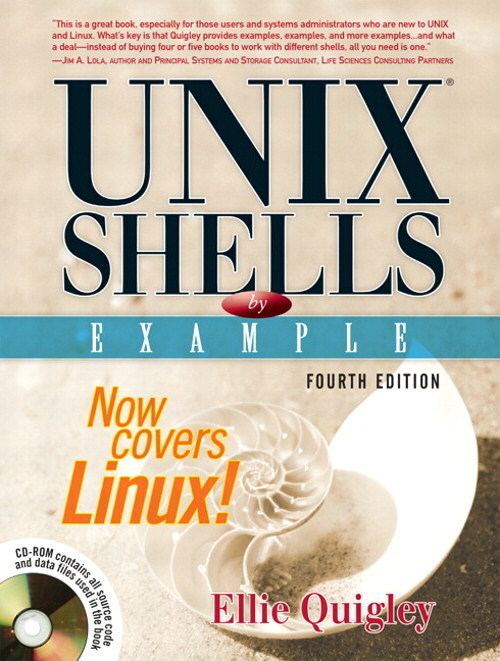 This book is recommended by one of my pal and even though I haven't finished the book, I found it really useful and I understand more about shell than ever after reading the first few chapters. Ellie Quigley is the woman who wrote the first shell programming book, with her 20 years++ experiences of being a shell programming instructor, she knows the foundations and tricks to take a newcomer or even advance shell programmer to next level of shell programming. By introducing and showing examples of how grep, sed and awk been used and using great illustrations that provided in the book, I'm now more enlightenned in writing shell script. 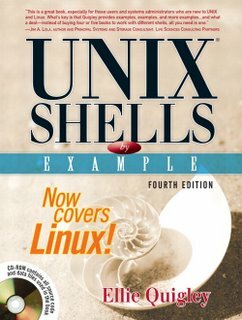 To be one good shell programmer, one should be really get ready and handy with the tools that provided in Unix or Unix-alike system. Ellie Quigley is really doing well on this part, I can't wait to finish her book. It seems I'm revisiting old stuffs this days, sometimes getting back to basic or foundation again will discover things that you think you already understood but you actually not, hopefully by finishing Linux Firewalls and Unix Shells By Example book, I can be get to improved to be better me. Saidar is the tool to view and monitor system statistic, statgrab provides a sysctl-style interface to all the system statistics available through libstatgrab, statgrab-make-mrtg-config allows you to generate MRTG configuration file and statgrab-make-mrtg-index is used to generate an XHTML index page from MRTG configuration files. Considering this is Server01, so I generate the mrtg configuration file Server01 using statgrab-make-mrtg-config. Checking the statgrab mrtg config file if there's any error, if it exits without error that means config file is generated correctly. Make sure you have mrtg installed, if not just install from package or port will do. 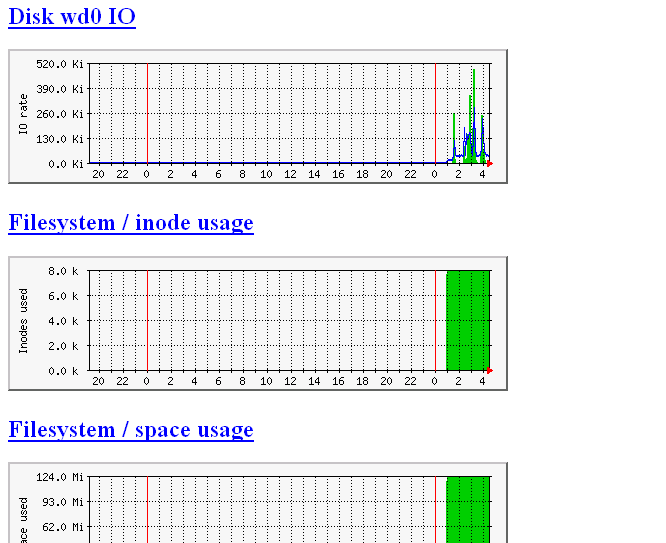 Now I just query the Server01 and also create the first mrtg trafic graphs and webpages. When you run mrtg for the first time there will be a lot of complaints about missing log files. Don't worry, this is normal for the first 2 times you start mrtg. If it keeps complaining after this time you might want to look into the problem. Finally I just add the mrtg command to run it every 5 minutes to generate mrtg report. I'm done with it now and here's my MRTG output after sometimes. If you can't live without gnome panel stuffs, considering yourself have another alternative which is recommended by my friend - fbpanel , it offers similar functions yet without relying much on other libraries, I quickly download all the fbpanel to my OpenBSD box and try to get it installed, after solving the compile errors, I finally get it worked on my OpenBSD box, here's how I have done it. If you don't have gmake installed, you should install it first via package or port. Here's the screenshot of fbpanel with it's configuration box. We all love Open Source, you always have choices and freedom!!!!! I'm currently reading this book - Linux Firewalls by Robert Ziegler to repolish my rusted skill in IPtables since I have stop practicing it for quite sometimes, even though this book is old but it is providing very good explanation on how, where and when you should apply the firewall rules, as well as the scenarios and conditions that applicable in real world environment. I just come across with the links below which might help you to figure out how to setup, customize and configure enlightenment window manager as well as enlightenment theme for E16 and E17, feel free to browse it :). The reason I mention this Distro is because of it is only distro I found using Enlightenment Window Manager, and it provides two environments for you to choose between E16(Stable) and E17(Devel). This is intuitive enough for me to try out and I really love it. From the irc channel #Enlightenment that I have noticed, there are not much people out there using Enlightenment, however I still give thumbs up for the work that have been done by the developers of Enlightenment. It provides fast switching, customizable key binding with e16keyedit and other cool features that you can't find in other Windows Manager. Here's the screenshot of Elive Linux. If you notice the bar down there, it's not gdesklets but Engage which is actually a default application of Enlightenment, and it is far more better. Both are very complete write up and you should take a look at the man page - raid and raidctl as well as the main project page - http://www.pdl.cmu.edu/RAIDframe. Systrace serving as host IDS/IPS for OpenBSD to monitor all the executables, it monitors and controls an application's access to the system by enforcing access policies for system calls. Using it might help to quarantine the bug of 3rd part applications that either install through packages/ports or source when we deploy it's access policies. Not only we can use it to protect the system but at the same time we can use it to trace the behaviour and functions that performed by untrusted executables in the system. So how can systrace actually can help us to understand suspicious and untrusted executable file. I used the script that been uploaded by the hacker a while ago as an example which is actually a synner.pl perl script that can be downloaded from securiteam.com. I have renamed back the script so that it is identical to me. In order to know what this executable file doing without even looking at the source code, I quickly generate systrace policy file for it. If you want to know what actually the function do, pick the one with the prefix native such as native-issetgid, then just read the manual of it. Here's the policy file - root_synner_pl that been generated. Systrace -d /root/.systrace means using the policy files in the directory /root/.systrace, this is useful if you have multiple policy files in the directory. If you just want to monitor single application per policy file, you can just go with -f switch. 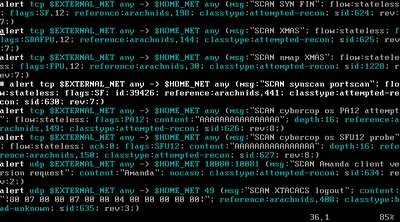 The synner script will connect to port 22 of host 192.168.0.140 in 10000 seconds. From the script description, we know that it is the spoof-Dos tool, and with spoofing it means it might be randomize so that's where we have seen that it need to access to /dev/arandom from the root_synner_pl policy file. Xsystrace is popped up if any access to the certain function is not implicitly allowed in the policy file, from here we can monitor each command line switches or options that need to access or perform what functions which giving us more clear view of the executable files. So here we can see that it need to access to /etc/resolv.conf, that might be used to resolve the hostname. 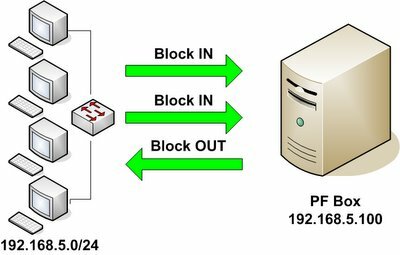 Then here we found out that it needs to perform function socket which create an end point for communication that uses AF_INET - address family IP v4 and raw socket. I click on permit to see how it goes next. There we see it perform sendto function which means now it is in connected state and transmitting message to another socket. After I keep repeating permit the same functions because it keeps doing the same thing, therefore I just click on Permit Always button to get it finished automatically. Now I have already known what is the executable file doing without even looking at the source code. Systrace is very flexible that not only it serves as application monitoring and controlling tool but as well as a decent analyze tool. It saves time of SysAdmin to analyze the third party applications to avoid backdoor or malicious function that running on the system by hand especially to someone not a decent coder like me. I would love to learn more about it since I get to learn OpenBSD function at the same time when I dig on it. 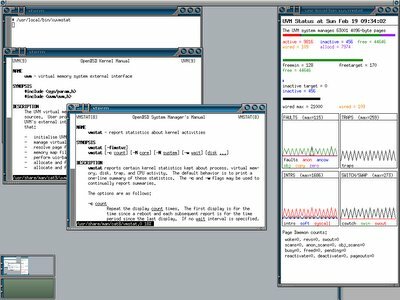 I have always like to learn more about the native and built-in tool for OpenBSD. I do use Argus - the terrific tool to collect and analyze network flow data, I have come to the place where I used to install argus from source all the time, and I think it's right for me to create OpenBSD port for argus and may it benefits others. Not like previous scapy port which is much more easier to create since it needs no source compilation, argus seems to be tougher for me. However after successfully installing argus from source by fixing it's dependencies stuff, as well as old lines that need to be commented out, now I can install argus using my own port, I do learn how to create patch for the source using diff command, and understand more about the internal of OpenBSD more than I was previously, it seems that creating port for OpenBSD is one good learning path for me at the moment. If argus port works properly, I will continue to create it's client port - Argus client to have the complete argus port done. The next port that I plan to create would be either python PyX or mysqltcl which is used by Scapy and Sguil project, maybe when I'm leet enough to create port, I will try to create OpenBSD port for Sguil including all it's components to have it fully functional on OpenBSD without going through much hassle installation. Anyway I don't plan to submit the port to OpenBSD.org yet due to this announcement, it is better to test out the current port tree for the coming release of OpenBSD 3.9. I finally decide to take the advice of dudes in #myoss and start my journey of building port, I prefer to take a simple one which is scapy since this is my first try out. After reading the man page and learning how others write the ports, I figure out that's not too hard but requires more practices and understanding of variables used in order to be handy in creating port. One of useful link would be this, it contains all the information needed to learn to write OpenBSD port properly. After hours of tinkering with it, I finally have my first OpenBSD port created - Scapy, this is considered an unofficial OpenBSD port for Scapy, since this is my first try without intensive testing, it may break but I myself have tested it under OpenBSD 3.8 release and current. Feel free to download the port and untar it to /usr/ports/net, then just go into py-scapy directory and make install. I plan to write more ports to sharpen my skill of writing OpenBSD port in future. Again another FREE product from VMware after VMware player - VMware Server, I myself haven't tried out yet so not much comments on it, however in the main site it states that VMware Server allows user to partition a physical server into multiple virtual machines, and to start experiencing the benefits of virtualization. Virtualization seems to be the future, Xen is one example. OpenSSH 4.3 released and you can find the story here. This is not the latest new however there's one new feature in OpenSSH worth mentioning. With OpenSSH 4.3, you will be able to build simple VPN solution since it can tunnel arbitrary network packets over a ssh connection between OpenSSH client and server via tun virtual network interface. This is neat and I will try to spare sometimes to play around. This is by no meant to PF hardcorer but for people who new to PF. When writing PF filter rules, new comers tend to confuse the direction of IN and OUT. The IN and OUT keywords in the syntax actually is not indicating the direction of network flow coming into or getting out from your network. 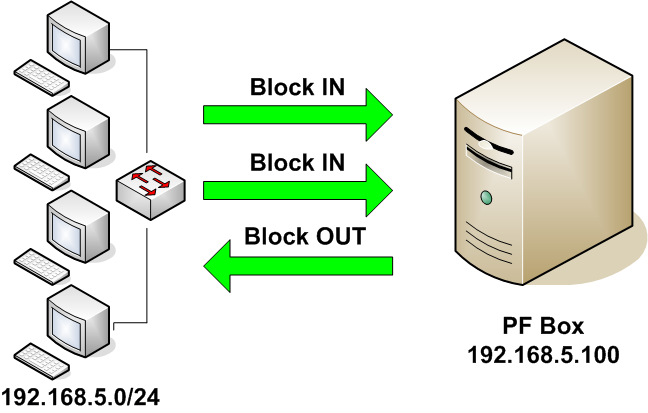 IN actually means the network flow that coming into your PF enabled NIC and Out means the network flow that either orignated from the PF enabled NIC or network flow that flowing out from the PF enabled NIC. The picture below illustrates the IN and OUT, the green arrows indicate the network flow. To further understand what it means, here I try to show three rules and assuming 192.168.5.100 has NIC with variable pcn0. The first rule allows the incoming traffics from 192.168.5.0/24 to 192.168.5.100 on interface pcn0. However if you apply this rule, you can still reach 192.168.5.100 however there's no response from 192.168.5.100. Hereby I put another picutre so that you have clear view of what have been mentioned above. If you are looking for the hardware to build your server or appliance that based on OS such as OpenBSD, FreeBSD or Linux, the URLs below maybe what you are looking for, thanks to Prabu who point it out to me. I'm more focusing on OpenBSD and have seen the URLs below. I'm not on behalf of any companies or trying to promote for any companies, however those URLs have mentioned and listed out what hardware is working on certain platform and not. This is useful resouces where you can take consideration when making decision on buying hardware . If you do know any link, please do tell so that people can have more references. Reading previous #snort-gui chat log that I have missed, I found that PADS will perhaps be integrated into sguil and I'm wondering what's PADS, after asking Richard about it, he shows me the PADS url as well as his blog that related to it here. PADS is Passive Asset Detection System and it is designed to complement IDS technology by providing context to IDS alert, another good thing about it is that it never generate any traffics but intercept and intepret it(passive). With the claim it seems worth to implementing this to IDS sensor. 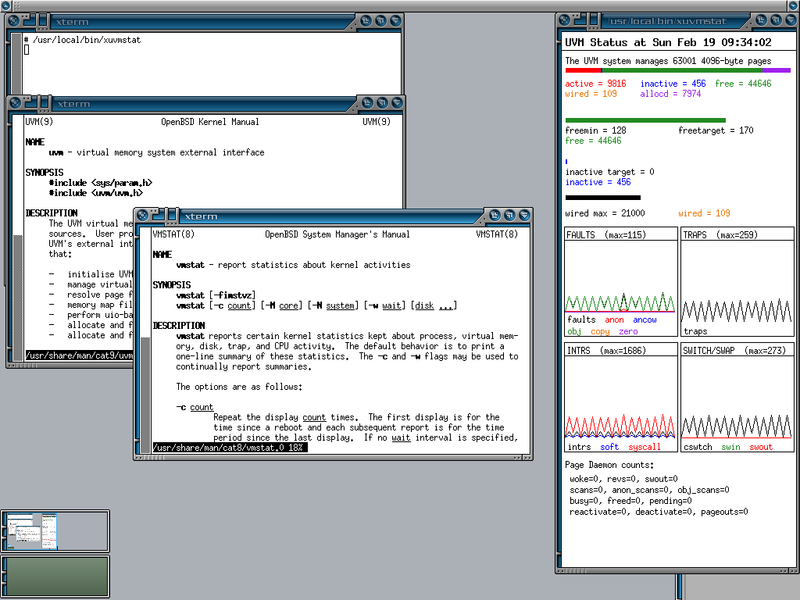 Since OpenBSD is always my main platform, I quickly download pads source tarball from it's provided link. 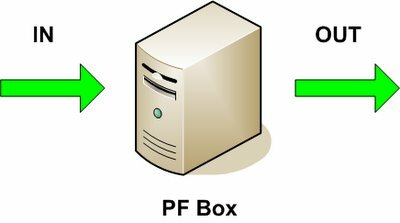 There's pads-archiver as well which playing main role as archiving pads data to permanent storage to lighten pads job to avoid packet loss when processing. Atm is asset to MySQL which is used to create the databases for pads, you only need it if you want the data to be inset into MySQL database. After finished downloading the source, installation is very straightforward, as usual I use stow to manage my software. Now I have to create database for pads using atm ready script and create proper user to run pads. shell>mysql -u root -p -e "CREATE DATABASE pads"
shell>mysql -u root -p -D pads -e "show tables"
I create and put all the pads configuration under /home/pads instead of /etc, I prefer it that way since those configuration owner is pads. There are two configuration files, each for pads and pads-archiver. Here's the content of my pads.conf. I prefer to specify all the options in configuration file instead of typing it in command line. 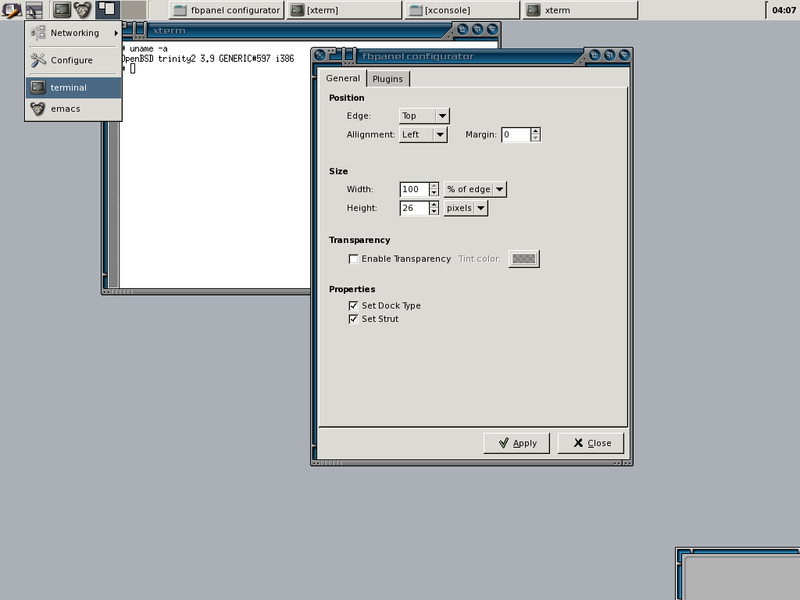 The network interface I use to run pads is pcn1. You can has different types of output result and by default it is csv format which is comma separated for different data field. However I used fifo since it's not writing to disks and directly archived to MySQL database using pads-archiver which is much more faster. Now I just need to run pads and pads-archiver as root. pads-archiver - Archive PADS data into permanent storage. [v] config - Processing '/home/pads/pads-archiver.conf'. [v] Initializing FIFO input processor. [v] Initializing MYSQL output processor. You may see the query error, this is due to there's no database table called arpasset for it to insert the data and it's not created through atm, I think atm is a bit outdated. In case you are storing the asset data in csv format, you can import it to MySQL db using the perl script - atm.pl. Just run it against the pad.csv file. PADS is really cool, I can just use it to profile and identify all the hosts in the network without tampering or connecting to any machine purposely. Pads has delivered the tool to archive the data, I do wish it comes with it's own complete sql script so that I can import it's default DB instead of creating my own especially for arpasset. Another reason I like about pads would be it can run against pcap file so this would really help especially when you just need to profile your machines in the network without running pads on the fly. If you are writing pf and snort rules, vim may suit your need. I use vi for my daily task and try to play with vim which is vi clone. I come across to know that you can configure vim to be your own editor with your own preferences and settings. 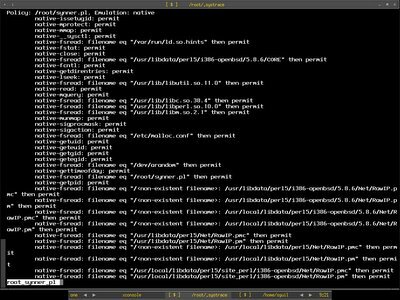 I have just found out that if I install vim by using OpenBSD port/package, you already have the vim syntax configuration file for pf and snort rules but you need to enabled it. Below are the screenshots of pf and snort rules file, those with syntax hightlightning and colorized. The vim syntax file is stored in /usr/local/share/vim/vim64/syntax and the syntax configuration files for pf and snort is pf.vim and hog.vim, so I have to enable it via .vimrc under user directory. Here's my .vimrc content under /root. 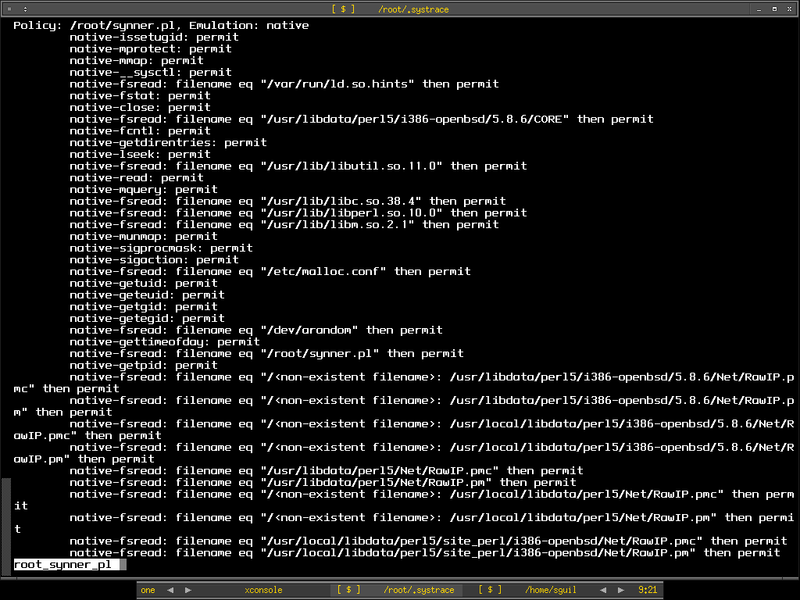 I need another files in /root/.vim which is filetypes.vim to load the syntax file for pf.conf and snort rules file. Now it's much more easy to edit and write the rules with the syntax highlightning and text colorized. However hog.vim is kinda outdated and need to be updated since there are lots of changes on snort rules syntax.